There’s no need to be weighed down by a heavy waterproof jacket in summer, so here’s the best waterproof jackets that weigh less than 350g. Manufacturers often give average weights or the weight of the medium jacket. All the jackets here were weighed when tested, so our stated weights may vary from manufacturers’. Even the best waterproof and breathable fabrics allow condensation to form, so it’s important that you can increase ventilation. A front zip can be used for venting, as can pit zips, while mesh linings in pockets also increase airflow. Lightweight jackets are often fitted with mesh pockets but this may not be ideal for really wet weather as they may also allow water to pass through. The hood should fit snugly so it doesn’t blow off, but it must also move so you can see where you are going. The peak may become bent, so look for a wired peak that can be reshaped. Normal jacket zips aren’t waterproof, so are usually covered by a single or double stormflap, but these are often removed on lightweight jackets. Water-resistant zips are commonly used on high-priced jackets, and some of these are fitted with an internal flap to channel away any water that gets thorough. Big pockets are great for storing maps, guidebooks and GPS receivers, but they can also be used to protect your hands from wind and rain. Rucksack belts may obscure access to some pockets, so make sure they are well positioned to avoid this problem. Higher-priced jackets will generally use the most waterproof and breathable materials available, so while there may be small differences between them this will be difficult to notice on the hill. Your comfort levels therefore will often be dictated by features such as hood, pocket and sleeve design. In contrast, lower-priced jackets generally have fabrics that are less breathable and may be less waterproof. Fabrics described as 2-layer or 2.5-layer tend to gather more condensation than fabrics described as 3-layer. Thin fabrics also tend to buckle in the wind, so they feel colder than stiffer fabrics that can trap warm air inside. This offers exceptional lightweight performance for the price. So you get excellent chest pockets that easily take an OS map while wearing a rucksack. They are also sealed rather than mesh-lined, so they won’t allow water to easily pass through the jacket. The 2.5-layer fabric has a Dry Touch treatment on the inside to help manage condensation, but you also get pit zips to allow extra ventilation. The hood is great too, thanks to a wired peak and great drawcords at the face and rear, all of which combine to allow great vision as you move your head. This is not the lightest jacket you can get, and it also feels slightly cold and clammy compared to a 3-layer fabric that controls condensation even better. A third chest pocket would be useful, like many lightweight jackets, but at least the two main pockets you get are great. There is very little wrong here if you want a practical lightweight jacket for hillwalking, but some details are better on higher-priced jackets. For £130 this is a superb lightweight jacket, but a bit more budget may bring a few benefits. The 2.5-layer fabric is stretchy and very thin, which shaves off some weight. I found this jacket fitted closely while still providing very good freedom of movement without the hem or cuffs riding up. There are two main pockets with mesh linings, which are easily accessed while wearing a rucksack belt and just about take an OS map. The hood is elasticated at the back and has face drawcords as well as a wired peak. A nice touch is a section of soft brushed fabric at the chin behind the zip. The weight is very impressive for what you get too. Those two pockets are mesh-lined, so water can potentially creep through this jacket, but also it is a tight squeeze to get an OS map into them. Also the cuffs are elasticated rather than having Velcro adjustment, so you cannot control their fit as well as others. The hood fit and movement is acceptable, but it does not move as well with the head as others. Finally, the fabric feels more cold and clammy than stiffer 3-layer fabrics. A lighter jacket with stretchy material – but the cuffs, pockets and hood are not perfect. The 3-layer fabric feels a little tougher than lighter jackets, and also it benefits from a thin bi-component knit backer to manage condensation better than some lighter jackets. You get two good-sized pockets that take an OS map easily while wearing a rucksack. The pockets are mesh lined which reduces cost, weight and increases airflow for condensation control. The hood is very good thanks to a wired peak and excellent fit and movement. There is reasonable movement in the sleeves too. All that for this price and weight is hard to beat for hillwalking and backpacking. It would be great if the pockets were sealed rather than mesh to help keep water out. Also a third pocket on the chest would be really useful. 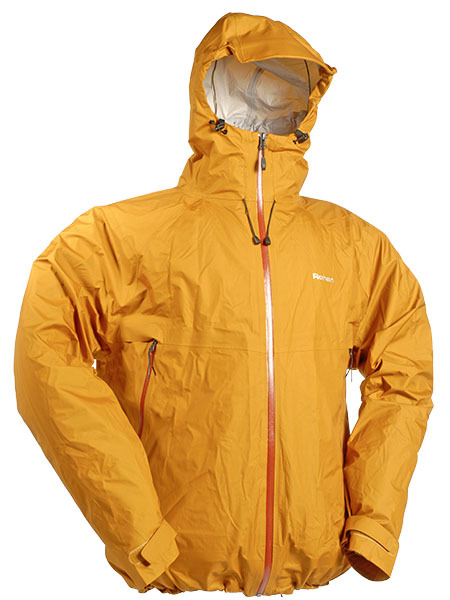 While the fabric is thicker than other lightweights, it still buckles easily in the wind more than heavier jackets. A slight niggle is that you do get a little movement in the cuffs when raising your arms such as during a scramble. There are lighter and lower priced jackets. 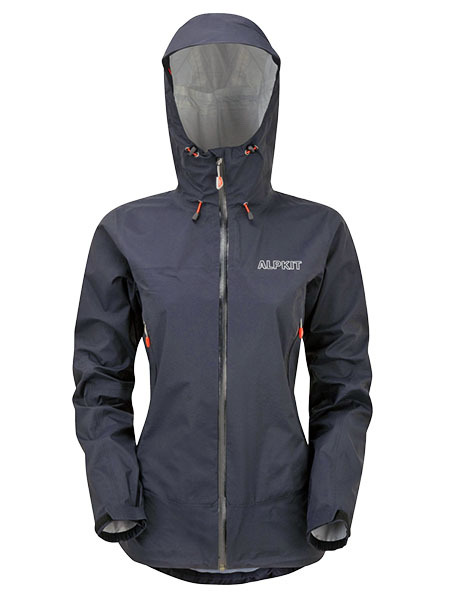 The hood and 3-layer fabric set this jacket apart from others, but the mesh-lined pockets may let water in. 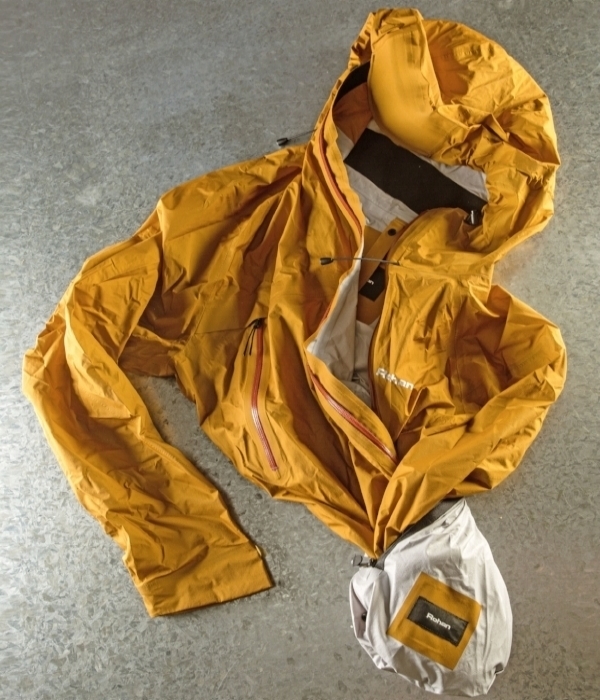 Having a third chest pocket sets this jacket apart, and can be used for a GPS receiver while the two, larger main pockets can store OS maps or used as handwarmers. All these pockets are sealed rather than mesh, so water can’t creep through them easily. There are also pit zips for added ventilation. The main fabric has stretch, the body is slightly longer than others and there is good freedom of movement. The hood gets rear volume adjustment, fits very closely and moves well with the head. That third pocket is a little small, so won’t take chunky guidebooks or maps, and access to the lower pockets is easily obscured by rucksack belts. While the hood does fit and move with the head well, it leaves the head more exposed than others as the peak is very small, and the sides of the hood don’t come very far forward. Finally, the material is a little colder and more clammy than stiffer 3-layer fabrics. Well-featured jacket with Patagonia’s eco-credentials, but some minor details could be better. 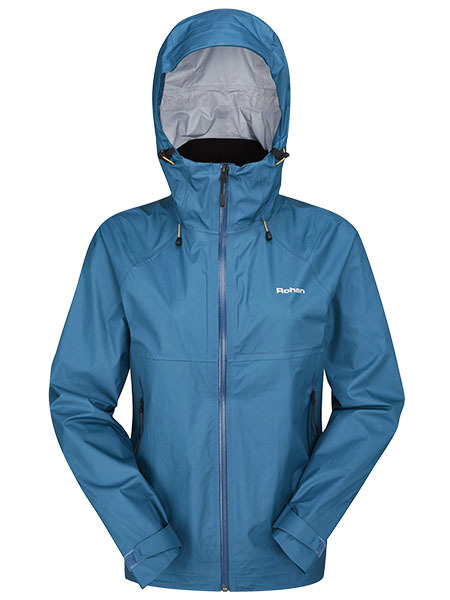 This is a 3-layer nylon fabric with high levels of waterproofness and breathability, but equally important is that this jacket has sealed rather than mesh pockets as well as a stormflap behind the front zip, which all adds up to more water resistance than many other lightweight jackets. Importantly it still has a good weight and the two pockets easily take an OS map, and you can access those pockets reasonably well while wearing a rucksack. The hood has a wired peak and also a great fit and movement with the head. So for general walking this is pretty good. The fit is quite baggy compared to others, and also we noticed the hem and cuffs tended to ride up more easily than others. So this is fine for walking but less ideal for scrambling. The main two pockets are nice and large, but items tend to sink to their bottom, which places them below a rucksack hipbelt, so retrieval is not ideal. There are lighter and lower priced options. Good 3-layer fabric with sealed rather than mesh pockets but the fit is not ideal.